This tart was on the menu for my Mother’s Day Brunch this year. I wanted to make an egg dish that was easy and elegant, and this definitely fit the bill. With both mascarpone cheese and gruyere, it definitely comes out as a cheesy treat. 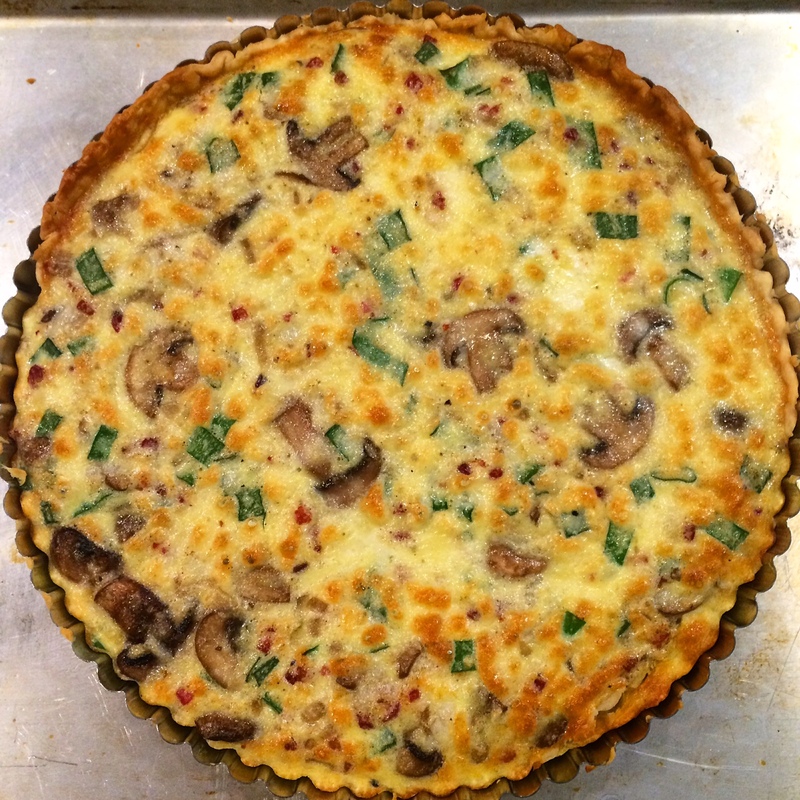 When I baked the crust for 10 minutes on its own, it sank a bit, but the filling still worked great in the tart pan and we were left with a delicious and cheesy egg dish, even if the crust wasn’t perfect. In the future I would probably try to weigh down the crust, using this technique from All Recipes. Of course, feel free to change up the fillings on this one. As with many egg dishes, there are so many options! Place an oven rack in the center of the oven. Preheat the oven to 400 degrees F.
Butter and flour the bottom and sides of a 9-inch tart pan with a removable bottom. Unroll the pie crust and gently press into the bottom and sides of the pan. Trim any excess from the top. With the tines of a fork, prick the bottom of the pastry. Using a pastry brush, brush the crust with the beaten egg white. Put the pan on a baking sheet and bake for 10 minutes, until the egg white has set. Let cool 10 minutes. Note that your crust may sink a bit in the tart pan. Don’t fret if it does this, I left mine as-is and it still ended up being a beautiful tart, even if the crust wasn’t perfect! Meanwhile, in a medium skillet, add the pancetta and cook, stirring frequently, for 6 to 8 minutes, until browned and crispy. Drain on a paper towel-lined plate. Add the onion and cook for a few minutes, then add the mushrooms and cook until softened and tender, about 10 minutes. Add a little salt and pepper to the mushrooms while cooking if desired. Let cool slightly before adding to the egg mixture. In a medium bowl, lightly beat the eggs. 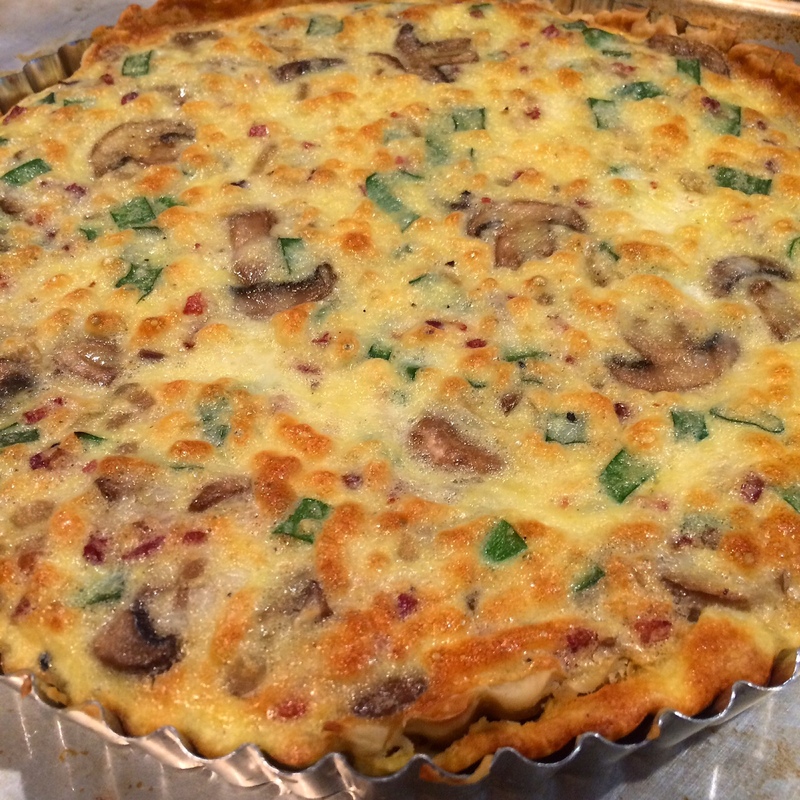 Whisk in the mascarpone, gruyere, scallions, salt, pepper and the cooled pancetta, mushrooms, and onion. Pour into the cooled crust and bake for about 18 minutes, until the mixture has set and the top is golden. Cool the tart for 10 to 15 minutes and then remove from the pan. Cut the tart into wedges and serve warm or at room temperature.